Abix is founded in 2009 in Skopje, Macedonia, as an IT company offering software development services, expanding later on to include hardware solutions, as well. Our software development portfolio includes mobile and web applications, sites, tools all the way up to full featured enterprise software solutions. Having specialized teams for multiple technologies and platforms and software developers with years of experience, always on the cutting edge on technologies and innovations in the industry, Abix can guarantee a fast turnaround, quality code and enthusiastic engineers who are always looking for a way to add more value to the product they’re developing. 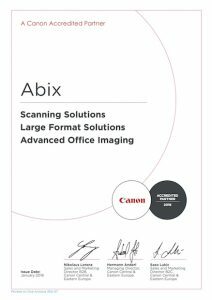 The hardware department is an Canon Authorized Office Imaging and Service Partner, offering office solutions, document scanners and large format solutions. In 2012 our CEO was awarded the Entrepreneur of the Year recognizing Abix’s success and growth. 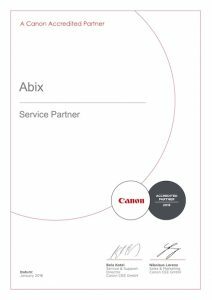 Starting from 2013, Abix has been awarded the ExcellentSME accolade consecutively each year recognizing Abix as a highly trusted partner in the development of software products. In 2014 Abix was awarded the Mobile Excellence of ICT award from MASIT, a national ICT Chamber of commerce for a marketing platform developed by us called Promotion In Motion, consisting of web solution for managing and mobile apps for serving promotions. In 2015 Abix is named a Nation Champion of Entrepreneurship for 2015 / 2016 by the European Business Awards, rewarding and recognizing business success, innovation and business ethics.